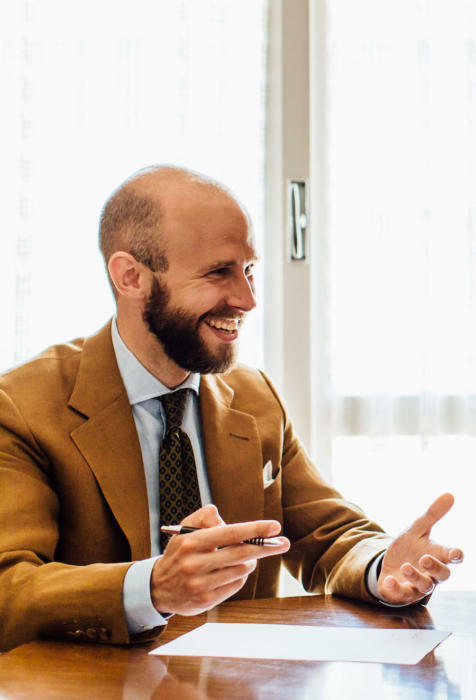 In recent years I’ve done an increasing amount of personal consultancy, meeting readers in person to answer their questions rather than just here on the website. I don’t really advertise it because I don’t have much capacity, and most people have come through recommendations. But I do find it extremely rewarding. The aim of Permanent Style has always been to help those with similar tastes and passions to me, whether through recommending products, talking about my experiences, or asking questions directly. And doing so over an hour or two, in person, is very satisfying. You could answer 100 questions in that time, and just as importantly, probe into why the reader is asking that question in the first place. The point of this post is not to advertise that work either, but rather to relate the stories of a couple of those readers, as I think others might find them relatable. The first I’ll call Adam. We started working together at the beginning of last year. Adam runs a construction company and spends his time either in the office or visiting building sites. He used to be a barrister and in the military, so he knows how to dress well; but since running construction he has largely worn the minimum required, which is jeans, a T-shirt and boots. It was so long since he had worn a suit that Adam didn’t feel comfortable wearing one. And because it was so long since he invested in clothes, he didn’t feel confident in where to start. Adam wanted to dress more smartly in order to reflect his senior position, and had money to spend - but he wanted to feel he was getting quality clothing that would suit his lifestyle. 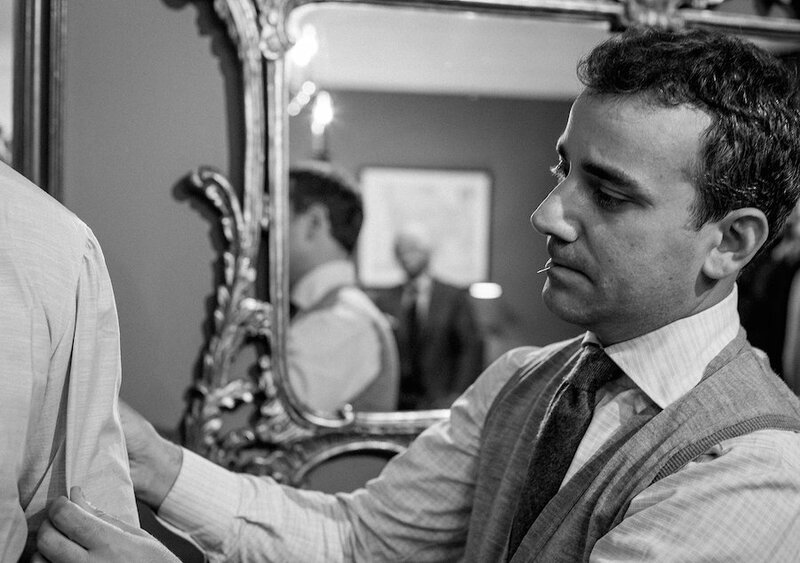 When I met Adam, he had already started by ordering some bespoke shirts at Turnbull & Asser. These were fine, but probably too formal for the kind of wardrobe he wanted. Instead I recommended Luca Avitabile (above), and Adam had some button-down oxford and denim shirts made, as well as some smarter poplins. We established what he valued was style and solid quality - so the hand-finishing of D’Avino, for example, was not something he wanted to pay for. When it came to tailoring, however, Adam liked the frequency of Elia Caliendo’s visits and the fact Elia would come to see him if he wanted. He was prepared to pay more for this, just as long as he knew what he was paying for. The same went for the shoes - we compared Edward Green and Crockett & Jones, and Adam went for the former. He started off by upgrading his boots into something that was still casual and very comfortable, but a lot finer quality - some unlined Shanklin suede boots from EG (below). 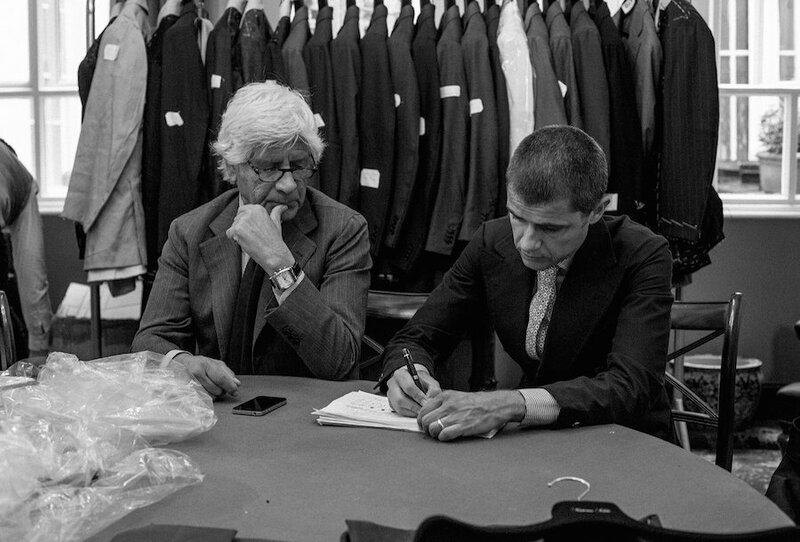 The Neapolitan tailoring will suit Adam’s work and leisure environment, where anything structured or too formal would be out of place. But if anything, the shoes have been the greatest success. They get regular compliments and can smarten up more things Adam owns, whether jeans or flannels. There have been other Edward Green purchases since. One thing we established between us after a while was how particularly Adam valued quality. But this is hard to assess. Unless you know how things compare, and what you’re paying for, it’s easy for someone like Adam to be put off by all modern fashion. It all seems like a rip-off, or aimed at someone else. The second reader I started with more recently. And, although the artisans we went to were quite similar, the reasons were very different. James had a lot of bespoke experience. He had been buying since 2011, beginning with a suit from Thomas Mahon, then jackets from Solito (above), shirts from Luca and trousers from Ambrosi. His wife is Neapolitan and they went back to see her family regularly. So access was easy, as was the language, and as a result he’d just started a suit with Panico (below). But if anything spurred the contact with me, it was the feeling that he had bought quite a bit, but didn’t seem to have a ‘core’ wardrobe of pieces that all worked together, and could easily be combined day after day. James runs a family investment firm. He can wear anything he likes, even if meeting bankers in Canary Wharf or having meetings in Zurich. But he likes clothes, and wants to wear a jacket more - whether in the office or entertaining at home. To that end he had bought brown and green jackets from Luigi, grey and dark-green trousers from Salva, and - one obvious extravagance - a pale-grey double-breasted suit fitted by Gennaro Solito in Naples. We established fairly quickly that the makers suited him, in terms of style, physicality and budget. But the commissions had often been a little unusual. Not much; but enough. They were the kind of things you should buy as a third or fourth commission, rather than a first or second. So we set out a plan for the next few months that focused on filling in some basics, with the occasional indulgence. First on the list will probably be a navy wool jacket. Easy to wear with every colour of shirt and polo James has from Luca. And suited to every colour of trouser, except the darkest greys. 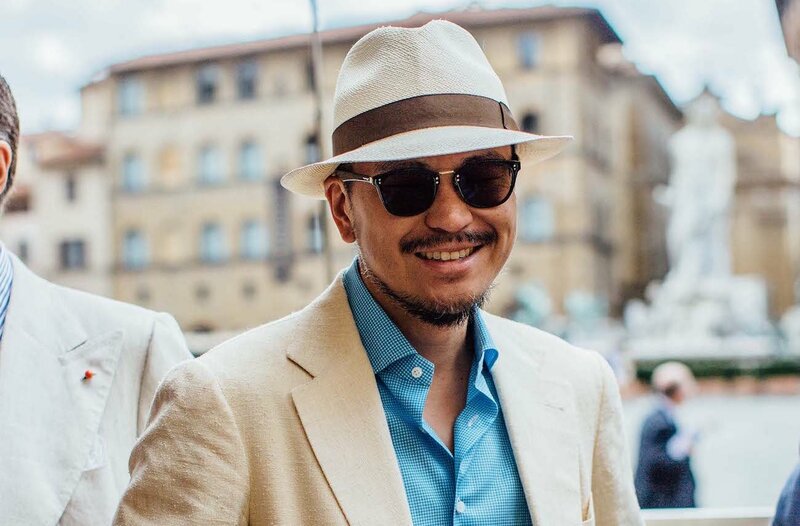 Next will be something in a cream or oatmeal, similar to mine from Elia Caliendo (above) or George Wang’s pictured at Pitti (below). James particularly liked the latter, but we’ll tone it down a little and do it in wool rather than silk. And some grey flannels, which surprisingly James had never commissioned. These will form the foundations of a wardrobe that can be swapped around into different combinations, and paired with lots of other things. The sponge of the cake, perhaps, rather than the icing. There will be room to experiment in the future. James has always liked the idea of a Prince-of-Wales check, and he might commission a mid-brown cashmere jacket with a very subtle one. It's the kind of thing he would have bought in the past, and worn a little but not enough. Once we've added some more versatile pieces, it will make more sense to go back to these. He also likes the idea of tobacco linen (don't we all?). But I suggested it perhaps as a pair of trousers, to wear with several great linen shirts he has - rather than a suit. James is not the kind of reader who needs my help with fittings, or other visits to makers. But it will be great meeting up now and again to see how the plan is unfolding. I hope other readers find something to identify with in both examples. Thank you to Adam and James for allowing me to share them with everyone. You can follow the discussion on Two reader stories: Starting and building a wardrobe by entering your email address in the box below. You will then receive an email every time a new comment is added. These will also contain a link to a page where you can stop the alerts, and remove all of your related data from the site. Great article and very relatable! Yet another aspect of your work at Permanent Style that separates it from everyone else. Good stuff, Simon. And much thanks to Adam and James for allowing fellow readers a look into the sort of quandaries that people looking to dress well may begin their journey with. Can you suggest some fabric similar to your oatmeal? I think you mentioned somewhere that you don’t like linen on linen, no? Generally I don’t, no, the textures can be too similar – you wouldn’t wear a flannel jacket with a flannel trouser in a different colour. I actually don’t get why, Simon ? Why wouldn’t you wear two different flannels as separates ? I would have thought the similarity of textures wouldn’t be a problem, but apparently it is. Could you develop on this ? So if the textures are very similar, you need colour contrast (and why not pattern). And if the colours are quite close to one another, texture contrat (and maybe a different pattern) would make it work. Correct ? Thank you, that’s quite clear. I always find it difficult to pair flannels with anything but tweed and you only have so much in the wardrobe. Besides, the style remains the same even if you have several colors of tweeds and flannels. Though heavy worsted would do the trick I suppose, with any of those. I sometimes pair lighter flannel trousers ( 9 Oz worsted) with a heavy 13 Oz flannel jacket. The textures are quite different and I think it works. But I agree that it’s a harder pairing than flannels and tweed. Very good article ,Simon . For someone starting in bespoke /MTM and whose trousers are dark blues , greys ,browns and a few cream would you also advise navy and cream jackets as first commissions ? Sorry Simon, I know this is a subject that has been touched on a few times before, but I still feel I don’t know (or understand) the answer. In relation to Adam, you say “He was prepared to pay more for this, just as long as he knew what he was paying for. 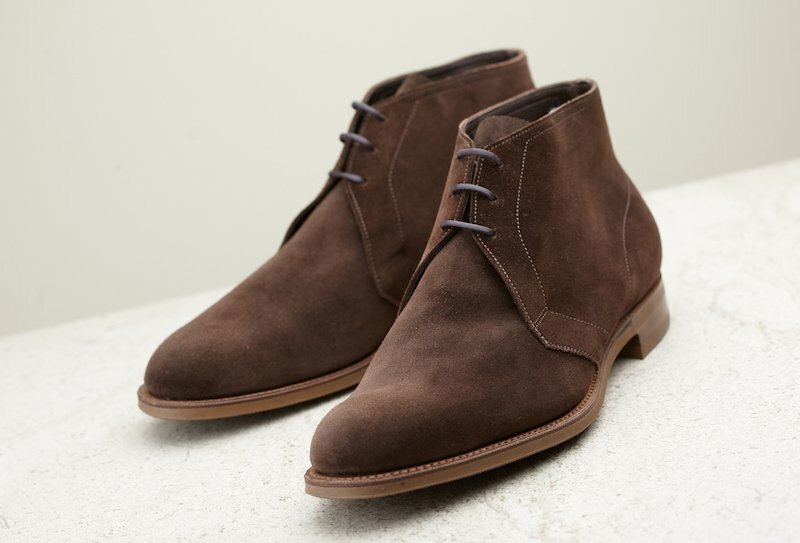 The same went for the shoes – we compared Edward Green and Crockett & Jones, and Adam went for the former.” Compared with Crockett & Jones’s handgrade line (because it is a slightly fairer comparison) what are the extras you are paying for in Edward Green? I ask because I think I take the same approach as Adam, but so far have reached a very different conclusion, but would like to be enlightened! Thanks for the really helpful article. It’s a variety of small points in the making, and quality of materials. With most Northampton makers, you get higher quality for higher prices. The difference (and what would put off Adam) is brands where design and marketing is clearly much more a focus – like the bigger designers. Thanks, understood. Is there a resource for who these makers are? I don’t really know where to look apart from this site and walking down Jermyn street! I don’t know an article with a comprehensive list I’m afraid, no. Walking down Jermyn Street is the best way to look at the quality and range on offer from the various British manufacturers. Edward Green, John Lobb, Foster & Son, Crockett & Jones, Tricker’s, Cheaney, Church’s, Grenson, Loake and Barker all have stores there. Foster & Sons has recently opened its own factory in Northamptonshire. I’d also visit JM Weston on Jermyn Street and George Cleverly’s store in Mayfair. I’d trust my own judgement over a journalist’s every time. Thanks for the answer Simon. I think the difficulty (even for the relatively well-informed consumer) is that once you get above a certain level (and venture into the land of diminishing returns) the variety of small points in the making and quality of materials aren’t easy to spot, even when you handle the shoes themselves, as I have. I’d love to know about the small points of difference though. Perhaps one for a future in-depth article. There are very few, and different models within the same brand can be made in different ways. So there really is no answer to your question. Loake, for example, have been known to use leatherboard for the heel stack in some of their shoes, and solid leather in others. Sometimes they use a metal shank, and sometimes they use wood. Edward Green hand-stitch the welts on some of their shoes, and they use a machine on other models. The small points are easy to spot when they’re visible, but harder when they’re not. You could always ask at the shop, but I doubt whether the sales staff will be able to help, even in the Jermyn Street shops. The days of expert sales staff are long gone. On some days you might be lucky and get one of the senior staff at the shop, and then you can ask away to your heart’s content. This holds for most of the Jermyn Street brands, by the way, not just the shoe manufacturers. In the end, it’s all about your budget, the fit, and the styles you prefer. You cannot go wrong with any of the Northampton brands. So, so relatable! Superb article Simon, and very interesting. I can certainly relate to James, as our lifestyles and work environments are not far off; particularly the ‘call’ to wear tailoring. 6-12 months ago I found myself with a wardrobe of MTM suits and jackets (or my first bespoke commissions) which were not bad at all, but were certainly the 3rd/4th commissions you spoke of rather than the core pieces you can actually get any wear out of. Particularly frustrating were times when I would travel (perhaps for a week). This is when I find it is most essential to own that navy and/or neutral jackets for winter, with a pair of flannels and jeans for leisure time. Nothing is worse than hauling a checked or windowpane suit abroad with you, only to wear it just the one time! For me the most difficult thing at the moment in building a wardrobe is finding the right fabrics. I am constantly keeping my eyes open for high quality and hard wearing red or green fabrics. Thank you very much for providing a very accessible article, no doubt inspired by some introspection regarding how “newbies” feel when running into these issues. My question is mostly about fit, and more specifically, for athletic figures (those with a wrestler’s build). For example, I am 5 foot 8 inches tall and weigh about 185. I am not fat, but I carry most of my weight in my chest, arms, and back. This creates difficulty in finding jackets that fit well, because inevitably, even my size US 44 jackets tend to run tight. I recently gained some muscle and went up from a 42 to a 44 and yet still find myself feeling constrained in my jackets, but a 45 or 46 would be far too large, especially off the rack and mostly in the shoulder width, though likely far more comfortable across the back and arms. In terms of Bespoke clothing, I have never done it, but I’ve always wondered if the key to its value for me would be in the extra fabric left in for future alterations (both letting out or taking in)? To me, this would be what would make bespoke appealing; that extra fabric meant for bodies that change over time. I can’t see myself swinging up more than 10 lbs, or down more than 10 lbs from where I am now, but I would love it if one suit could accommodate all three of those sizes, rather than owning 3 suits for example, in each size. What maker would you recommend to a stateside individual, based in Virginia (just outside of Washington, D.C.) that would be capable of outfitting someone of my proportions and demands with excess fabric, or would any bespoke maker leave plenty of fabric between the seams? Bespoke will always have more inlay than RTW or made to measure (custom in the US) but that doesn’t mean it will be able to cope with all changes. Muscle changes can be harder than just gaining fat, for example. Still, you’d certainly be better off. The trouble is finding good bespoke in the US, an issue we addressed recently on the post about New York tailors. To be honest, if you haven’t had it much then I would suggest trying cheap MTM first, to see what you could get there to just get a better fit, rather than focusing on something that can cope with weight changes. How much do these sessions cost by the hour, Simon, and how many hours does one typically need? The problem I’m having is with financing. Can you put me in touch with a wealthy benefactor whose pleasure is derived from paying for and seeing their beneficiary in beautiful clothing? Great piece Simon. I had to smile when you wrote “He used to be a barrister and in the military, so he knows how to dress well”. That may be worth an article all on its own. The item of clothing that jumped out at me was the tobacco-coloured jacket in the first photo. It looks super even with those fairly wide lapels (in general I like lapels to be narrow). Tobacco and blue is a match made in heaven. I find that it works far less well if reversed though – a tobacco rollneck, for example, under a blue/navy jacket is not so appealing. Do you have any views on that? Thanks. No, I’m not sure I’m ever wear tobacco-coloured knitwear, it would be too strong a colour. Light or mid-blue jackets equally – only in the summer, and only with more conservative things around them. Sorry to hijack this post. I just recently discovered PS and have to say that I really like what you write and the style you promote. It is a great source for inspiration. From one of your posts I learned that you are also a father, which made me hope you might have one or two interesting thoughts on dressing as a father. Especially how you dress when you know you will be spending the weekend/evening playing with your children outside, on the floor, feeding them, etc. I often find myself changing into some old jeans and jumper for that, just because they are easier to clean, more robust, and it is not the end of the world if they get stains. You obviously don’t need to look sharp when you play with your children, but what if you wanted to? Any tips? That’s nice to hear, thanks. I certainly wear the more robust end of my wardrobe, but it’s perfectly possible to look good – it’s just a more workwear or country aesthetic than a tailored, city one. So good denim (good quality, fitted well, even bespoke if you want to), a good oxford shirt perhaps (again, good material, good fit), and good knitwear, perhaps a hardy wool like shetland or a great cotton like a loop wheeled cotton. You’ll find plenty of posts on those pieces if you search around the side, but a good place to start might be here. You mention the T&A shirts too formal. Do you generally find English shirts to be more formal than Italian shirts? In general, yes. They tend to use thicker floating linings in the collars which work well with a tie, but less so without. They don’t use handwork in the collars that can help also when worn without a tie. And just in terms of general style, they are generally more formal and less used to using casual materials or making shirts for casual clothing. How does Budd compare on the formality front – I imagine it’s somewhere in the middle? Does Budd use linings? I thought that they don’t. Hilditch & Key did not use linings when I was a customer. H&K, after closing its factory in Fife, moved production to a factory in Italy. The quality dropped and prices rocketed. I’m considering now Budd and Emma Willis. Linings would put me off – they were a deal breaker when I considered T&A. Recently I’ve been using Wil Whiting for my shirts, and he has done an extremely good job with more casual shirts as well as formal (I’ve also used Luca in the past). I would highly recommend Wil. One might need to decide based on price though, as Wil is not the cheapest of shirtmakers. Nice idea on working with some tailors, yes. I hope you don’t mind me asking two things here as this is not your general type of post. 1) Have you considered doing a review of bed sheets, manufacturers, 5read counts etc.? 2) (and I understand if you want to edit this out as it’s personal) have you considered shaving your head as a bald man? I’m bald too and I hate having hair at the sides like you and nothing on top, I feel a lot better when my head is shaved all over. Excellent article, Simon! Well done. One day I hope to be an Adam or a James. Nice opening picture Simon: stylish tobacco jacket and smiling wearer – good to see. Interesting description of the possible quandaries that face all who read PS. Correct selection to build a wardrobe, without excessive spending is the key challenge. Once a capsule (small interuseable collection) is formed other avenues of higher risk can be explored. Taken experimentally it can be fun and I think it a subject to be enjoyed wherein discovery is always welcome. As you outline the matching of actual requirement with appropriate and affordable style is the balancing act. Opening up the world of sartorial choices for readers, beyond that of the traditional, is thus one of PS’s finest achievements. “[…] a Prince-of-Wales check, and he might commission a mid-brown cashmere jacket with a very subtle one.” – Sounds like my cup of tea. Any leads yet on the fabric side that you could share? Thanks! 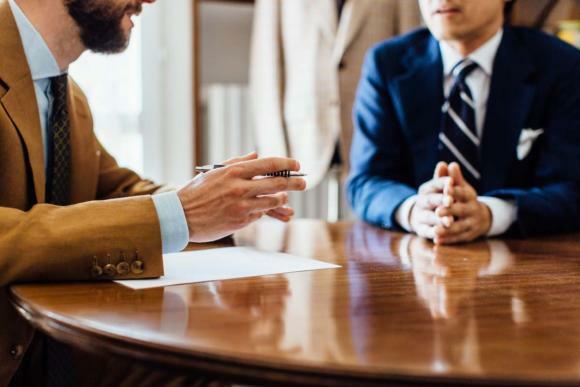 In my past job, two clients of mine, one running a pharmacy, the other in the medical profession – found themselves dressing more casually with the latter having a entirely new “casual friday” dresscode where a suit was no longer applicable. So for your consultation with Adam, it’s best to suggest to him that he needn’t wear a suit at all. You can get him jackets made of a cotton/cashmere that’s half-lined or unlined, in even a tropical wool weight – a slightly heavier wool for autumn/winter – and linen for spring/summer. For trousers, he should be given cotton gabardine, with side belt adjusters and everything else he wants spoken for him. It can also be in linen. The shoes were a good choice, because for my two gentleman, I already knew that the best choice for them for being on the job constantly meant a pair of desert boots would suit well with the trousers as aforementioned. All in all, I don’t feel we should alienate clients from local know-how. And that means he could have shirts from Emma Willis, or if he’s feeling fancy one from Charvet. It needn’t be too fussy. I like Gentleman’s Gazette and Ask Andy About Clothes and Parisian Gentleman for different reasons, however, their website formats are shocking in comparison to Permanent Style. Please can you give us a little history of how you came up with your format, the whys, hows, what’s when’s etc.? What makes you choose to do a post and when and how do you plan? I assume you have some big plans as this is now your full time job? Thanks Joel, that might be a nice idea for a post. I don’t have any big plans, no. As I wrote at the time, I want the site to go on doing what it does well. This works, is appreciated and is sustainable. No reason to change it. I would find it inspiring. It’s the things like how does one man manage to set up a shop on Savile Row for the Pop up etc. 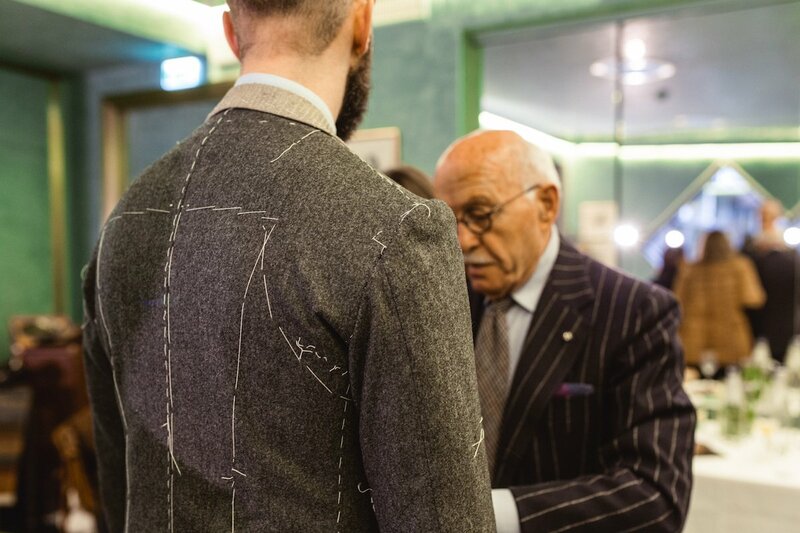 Do you know of any Neapolitan bespoke tailors that travel to Boston? The city is well covered by Savile Row but the trunk shows I’ve seen for Neapolitan tailors just go to New York. Also curious if there is demand from other readers or if others have approached tailors about this already. Thanks. Do you still have that wonderful shop “Louis Boston” in Boston? They used to sell Kiton and they be able to offer MTM. Louis Boston closed a few years back. Thanks for the reply. On chukka boots, please, Simon. Am comparing Carmina Rain boots to Crockett and Jones Tetbury, what is your opinion mate? May I ask who made that tobacco coloured jacket? Bespoke I guess. Linen? Yes – from Dege & Skinner. Full review on it here. These stories are very interesting because many of us have the exact same issues. Very helpful, as well. 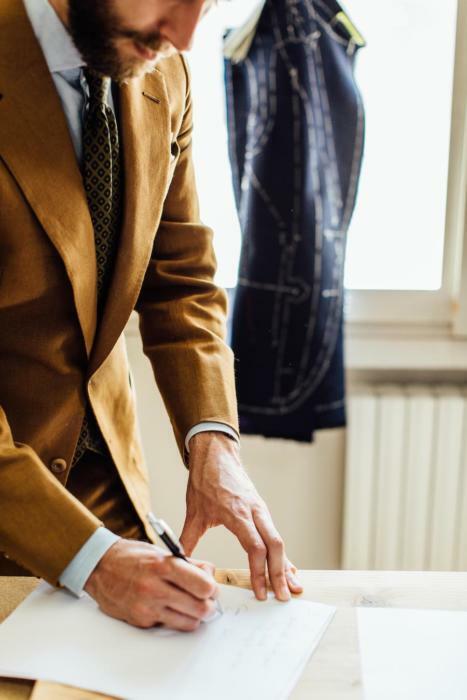 In Washington, DC, Fields is a well regarded tailor who makes custom clothing. He does MTM however I’m certain he does full custom work as well. Very interesting article, thank you Simon. What puzzle me thinking of my wardrobe are the steps beyond the basics. I have suits (mainly higher end RTW, some MTM, even bespoke) in various shades of blue, grey and black. Plus some great odd jackets and blazers and various high quality casual clothing, coats etc. Now: How to think about expanding beyond the basics? 2 Comments: I spot mainly plain colors and hardly any stripes (pinestripe, chalkstripe, glenn check, windowpane) in your pictures. Is this a deliberate choice and why? Second comments – How do you think about personal color analysis [see here for the term https://en.wikipedia.org/wiki/Color_analysis_(art) ] and picking only colors supporting the complexion and contrast of the face, i.e. the face being the most prominant item in an appearance? I don’t wear many stripes or checks, no. I find them a little loud – something people often wear when they’re first discovering tailoring – and I find them quite restrictive. They have a certain look (perhaps formal, perhaps banker, perhaps dandy) that cannot be altered by the shirt, tie etc. Personally I prefer plainer pieces that can be played around more like this. Colour is useful to have a basic understanding of, but not worth a man spending quite as much time on as a woman. This is because menswear is generally much narrower in colour (you’ll end up wearing a lot of navy and grey whatever you do, and not much bright strong colour) and because men are less likely to wear one colour in big blocks, or head to toe. It is worth understanding, though, that stronger colours tend to need a stronger colour of skin, and that blues and navy are kinder on almost all skin types than white and black. You might also find this piece interesting on warm and cold colours. If you want to see loud you should check out the last page of Plaza Uomo 12. That’s some loud colouring. I looked up these chukka boots from Edward Green you highlighted and remembered that Antonio Meccariello sells what seem to be the same boot for one fifth the price. Do if know if there is a big difference in these boots? Do you have any suggestions for best executing this look day-to-day in a relatively conservative office environment (i.e. dark worsted suits)? Do you have any comments on the above or suggestions? The last obvious open part of this equation to me so far is a ‘value’ neapolitan sports jacket, I’m having difficulty settling on who to use. I think those are very good choices Tim, and I think over time you’ll just refine them or try one or two more depending on style. I am on the hunt for my first pair of dress shoes. Clothing-wise I never wear suits, but rather the odd jacket/trousers combo (those latter varies from flannels, to chinos/cotton, non worsted wool, sometimes linen). I visited the EG retailer here in Brussels, and ended up looking at both Berkeleys and Malvern (both dark oak). One has a punched toe cap, the other is a full brogue. Both are really nice, and if I could afford it both would come home 😉 But as for choosing, would you have any input? Hey man! Love your website and content, keep it coming ✌️Had a question, hoping you could help me out. As a youngster (27 years old) I am fairly ‘new’ to, but loving menswear. For the past three years I feel like I have been spending money on not so versitile pieces, and also sometimes with the wrong fit, so that was a bit of a waste. I am getting into a new sales job very soon, and would say I need a suit 3 days a week. As I love menswear, also just odd jackets and trousers, knitwear, shoes, etc. (and thus not only formal wear), I am looking to now really ‘start’ building a wardrobe, as I now have a sense of what kind of style and details (like side adjusters, one pleat, cuffs) I like and what the fit (not neglecting comfort!!!) should be. I do live in a rainy climate, with 5-17 degrees celcius most of the year. 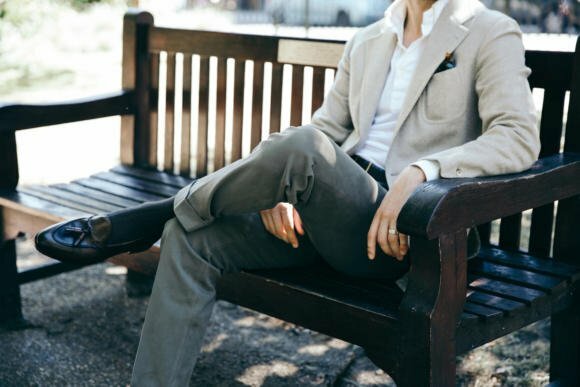 Would you have some tips on starting off with the right pieces, for business but also a bit more casual / odd jacket and or trouser combo’s? Personally, I am thinking of buying three suitsupply suits first, in blues and grays, and after that getting a few odd jackets, shirts, accessories and trousers as basics, maybe finished with some new shoes and knitwear, due to the temperature I live in. What would your approach be? Do you have some practical must haves when it comes to the items mentioned above? After getting those basics, I will, maybe slowely replace those pieces with MTM stuff, when I have a bit more money to do so. Nice questions. You’re basically asking how you should build a core/capsule collection for tailoring, which is a big area but also one we’re focusing on more in the coming months. These don’t cover suits, but future pieces will. Perhaps sign up to the newsletter to make sure you don’t miss those. In general I’d also add the advice that you should only buy one suit at a time. Don’t buy three shirts, let alone three suits, until you’re 100% sure on the style and maker. Your first few pieces should also include a plain navy suit, a plain grey suit, and a navy or brown/oatmeal jacket with grey trousers (flannel or a high-twist wool). I did buy a navy suit just now 🙂 The grey flannels will have to wait until next winter probably! Oh good. Slow and steady Ronnie, that’s the key. With learning little things all the time.